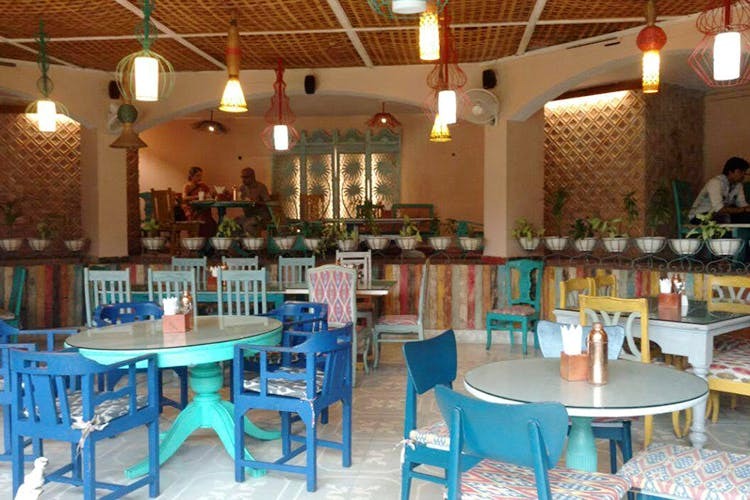 Spicy food, fresh lemonade, pretty-as-a-picture interiors and a little outdoor area complete with umbrellas; The Potbelly at Bihar Niwas is fast becoming a favourite. The Potbelly is pretty much responsible for acquainting us with Bihari food beyond the Little Chokha. Think spicy seafood, Moong Dal Puris, Laccha Parathas and fried aloo. We think it’s a good idea to start with a basket of assorted pakoras or a piping hot bowl of Keema Maggi on an especially wintry or rainy day. Follow this up with a meaty thali. Our picks? The Dehati Fish n Chips, Khada Mutton with rice and the Kali Mirch Chicken served with green puris. The Makhana Thali seems to be popular amongst the vegetarians. Wash it all down with a fresh Apple Cinnamon Lemonade or the Rhododendron Tulsi Iced Tea- you’re bound to feel refreshed. Don’t forget to end your meal here with the surprisingly good Pineapple Upside Down Cake. Head to Bihar Niwas for a working lunch or a chai and pakora break.